Does its job well. So you can do what you do best. Healthcare Blocks is a cloud-based application platform, designed to eliminate the burden of infrastructure management and system maintenance so that healthcare technology organizations can focus on product development. Our specially-designed technology automates and enforces many of the requirements mandated under the Health Insurance Portability and Accountability Act (HIPAA), enabling developers and engineers to focus on features and functionality, rather than regulatory compliance. Leave the plumbing to us. Developing a HIPAA-compliant stack is challenging and costly and comes with operational responsibilities that far exceed those found in non-healthcare scenarios. Wouldn't your organization prefer to focus on its core product and services instead of “HIPAA plumbing”? Our platform relies heavily on Amazon Web Services (AWS), leveraging its hardware and myriad services in a complex orchestration that provides stability for you and 24/7 monitoring by us. This security leader in the Cloud infrastructure space is compliant with dozens of certifications and audits, and your data is safeguarded by NIST standards and CIS benchmarks. Start small, with a single instance for prototyping or running staging environments, and scale out to a multi-instance high availability environment when you need to store real patient data. Our transparent pricing is very affordable compared to other DIY options. After your environment has been provisioned, it only takes a few minutes to setup and deploy your application. No need to rewrite any code or integrate with any proprietary APIs - just Git push and your app is running on Healthcare Blocks. Our platform is also compatible with third-party continuous integration (CI) and deployment services. Healthcare Blocks is built to service healthcare companies. Our customers praise our top-notch technical support, thinking of us as a virtual extension of their tech team. We can own the traditional “DevOps” role, responsible for system uptime, reliability, and security - and help with HIPAA compliance, architecture, scaling, and options for integration with hospital and laboratory systems. Healthcare Blocks complies with the HIPAA Security Rule and HITECH Act, having implemented the standards published by the OCR in the HIPAA Security Rule Crosswalk to NIST Cybersecurity Framework. 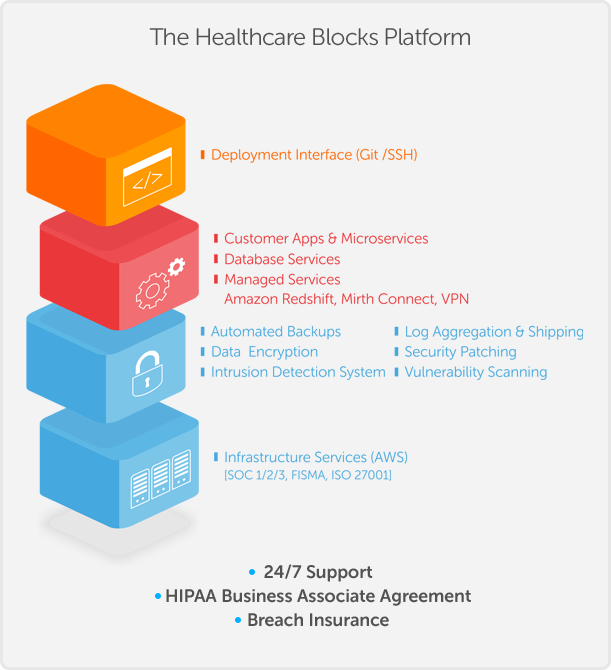 Healthcare Blocks has been tested and certified by security professionals from Kaiser Permanente, Morgan Stanley, and various HIPAA-focused consulting groups. Our platform has passed multiple penetration tests conducted by independent firms on behalf of our customers, and these tests continue frequently. Our team members have been building solutions using Amazon Web Services since its inception. We launched Atlas Health - the company behind Healthcare Blocks - to create a cost-effective, Cloud-based platform for other healthcare technology organizations. We draw on decades of technology and consulting experience, having participated in and collaborated with numerous healthcare-focused business accelerators/incubators, and mentored other healthcare startups. We're covered when it comes to our own internal HIPAA compliance. We have detailed procedures and policies in place that govern how we manage customer environments and data. We have a Business Associate Agreement (BAA) with our infrastructure provider, Amazon Web Services. We sign a BAA with any customer storing protected health information on our platform. Our $2 million breach insurance policy is underwritten by an A-rated carrier. We also carry a general liability policy.